Photograph currently believed to be of the oldest born American numismatist. Lukens, Isaiah Quimby (1779-1846), Philadelphia inventor, machinist, gun and clock-maker. He was born at Horsham, Pennsylvania on April 24, 1779, the second son of ten children born to Seneca Iredell Lukens (1751-1829) a clockmaker and Sarah Quimby (1755-1843). His father taught him the mechanical skill and craft of being a machinist and in the fine art of clock-making. He made the clock for the Old State House “Independence Hall” in Philadelphia in 1828. It was removed in 1924 and installed in the new Town Hall at Germantown. 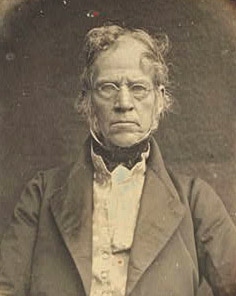 He was one of the founders of the Franklin Institute, and was elected its first Vice-President. He died of an aneurysm of the aorta on November 12, 1846, at Philadelphia, Pennsylvania. He is buried at Laurel Hill Cemetery, Philadelphia, Pennsylvania. His estate probate record shows he left small boxes of minerals valued at $1.00, minerals in glass vials valued at $20.00, a medal in a case valued at $1.00, a box of precious stones valued at $2.00, a set of cornelian stones valued at $5.00, his library valued at $20.00, a small box of agates $2.00, a box of rubies $2.00, drawers of medals and case $20.00, agate boxes $7.50, Lot of minerals $250.00, medals of Christ $0.75, agate stamp $1.00, book & mineral cases $15.00. There are a few Daguerreotype photographs of him by Charles Wilson Peale. His coin collection was sold posthumously by W. S. Berrell & J. S. Burr on January 4, 1847.